Magnificent on display and in flight. All new highly detailed plastic parts. We have updated every plastic part in this kit and you won’t be disappointed! 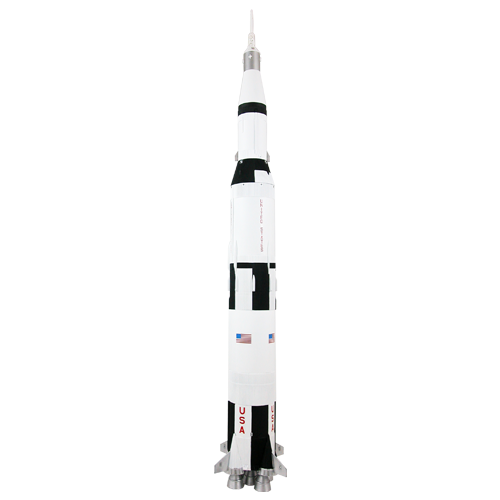 Accurate Apollo II body wraps, detailed blow molded transition, easier to assemble escape tower, injection molded fins and highly detailed removable display nozzles that doubles as a stand. FOR A LIMITED TIME, WHILE WE CELEBRATE THE 50TH ANNIVERSARY OF SENDING MAN TO THE MOON, WE’VE INCLUDED A “BONUS!” Check back often for more details about this soon to be released kit. Just received, my Saturn V 50th Anniversary edition. 1st was very impressed with packaging, all parts were either bagged or protected from shipping damage in the box. Instructions are clear, and easy to follow. For my building sequence, started with motor mount, and then moved onto Command module construction while waiting for glue to dry in other steps. Plastic for capsule & escape tower went together perfectly! So far this model has been a pleasure to build. Will launch on July 16th anniversary. Excellent kit. Comes with four cubes of clay – but you only need two. I recommend glueing the fins to the body for added strength. Then secure vacuum wrap on top of fin.